Simple Gluten & Sugar-Free (But Sweet) Morning Breakfast! In Chinese Medicine, we encourage folks to eat healthy porridges for the first meal of the day. The reason being is that the cylce of qi/energy creation in the body starts with our Earth (Stomach & Spleen organs). All of our energy begins from our Stomach and Spleen and the food we eat. We need to nourish these organs with what they love—WARM porridges/soups/stews. If we start off the day with cold, damp foods (sooo many people eat yogurt thinking it’s a good morning start, and sometimes it is, but most of the time it isn’t), we start off on the wrong foot for keeping sustained energy levels throughout the day. The flavor of Earth is Sweet, but not the kind of sweet that’s from sugar…we’re talking the kind of sweet that comes from fruits and grains…the subtle sweetness. 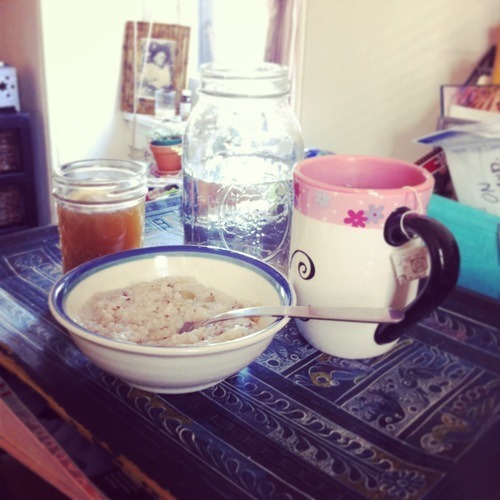 I make a DELICIOUS porridge in the morning that I can’t get enough of. It’s simple, take about 8 minutes, and starts off the day right. It uses NO sugar, but because of the banana, it’s PERFECTLY sweet. And I am someone who LOVES sweet, so this is a way I can use it less in my life. I feel deeply nourished, calm, quenched, and supported when I eat this as my first meal of the day. You can make a batch and refrigerate it and reheat for the following few days! In small pot, heat water with dash salt until boiling, add in Rice N Shine, Stir, and reduce heat and simmer without cover. Add in Coconut Oil and Cinnamon, stir. Peel banana, break in half, and add to pot. Using potato masher, mash down banana until it is all mashed. Stir and integrate. Add in walnuts and flaxseeds. Stir. Stir occasionally. After a few more minutes, when water is sufficiently absorbed by rice, remove from heat, stir in almond milk. #yogapuncture at #dhyanayoga next saturday!! #Nourishthyself !!! Go to www.dhyana-yoga.com to register.